It is the Scriabin concerto that is the main appeal here, both because it is still rare in concert, if less so nowadays on disc, and because it is given a very impressive performance. Demidenko sounds completely at home with this music, especially its slow movement as well as in the lyrical moments elsewhere in the score. The work can sound elusive, as its orchestral part is not especially opulent or ecstatic like Scriabin’s later scores for orchestra. The piano role is more dreamy poetry than dramatic display but Demidenko has its measure, and plays with the kind of super-sensitivity the work demands. His view of Scriabin is quoted in the booklet, where he describes him as a composer who “plays with our expectations, his ideas are elusive, his ground-plans unpredictable …” and “… in the ambience, phrasing and cadence of his music we meet with a world almost without skin, a world of nerve-ends where the slightest contact can bring pain.” Small wonder he wanted to record it twenty years ago when not many others did. His version is still among those which most effectively reveals the work’s secrets. If in the Scriabin Demidenko is a prophet, persuading us of the promise of a new world, in the ubiquitous Tchaikovsky work he seems more concerned to show new aspects of a familiar masterpiece. Thus the slower moments in the first movement in particular are played more broadly than is usual, drawing attention to their beauty – or merely to his own interpretative skills, depending whether you find that sort of point-making appealing or not. In a catalogue filled with hundreds of fine versions there is room for this approach, and it is to be preferred to many a routine run-through. With Demidenko there is no question of his ability to rise to the virtuoso demands of the many passages of Lisztian display, where he is fast, fiery, exciting – and accurate. Throughout both works the BBC Symphony Orchestra and Alexander Lazarev are supportive collaborators in the soloist’s ideas. They sound admirably fresh and committed. The solo winds are delightful in the Tchaikovsky in particular, and the brass respond lustily whenever Lazarev gives them their head. The recording, despite some brittleness in the piano treble at times, is generally satisfying, with a concert-hall ambience and a good balance between orchestra and soloist. So this CD remains very desirable both for its general high quality and for its rare coupling. Testament has Solomon no less in the same pairing, but I have not heard that; it's also on Documents and EMI Icon. In the Scriabin, Yevgeny Sudbin on BIS has won high praise, and has SACD sound. In the Tchaikovsky the time has long passed when anyone can speak of a ‘best version’ or even a ‘top ten’ perhaps. When I want to hear that evergreen concerto, I usually take down one of Argerich’s versions, and am astonished afresh at how that supreme tigress of the keyboard identifies so completely with the work. 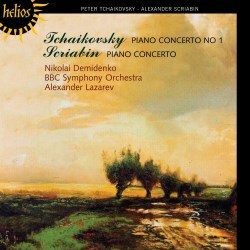 Demidenko has hardly any less technical prowess but his views are different, and at the Helios price this remains one of the Russian piano concerto bargains.